In 1976 Andrew Whitley left his job as a producer in the BBC Russian Service and started a bakery in Cumbria. The idea was to make wholemeal bread from organic British wheat flour ground at the local watermill as a way of supporting a more self-reliant rural way of life. People in the know pointed out that a place with more sheep than people wasn’t a great location for a bakery making wholemeal bread (for which there was little demand) using flour that was unsuitable. But what The Village Bakery in Melmerby lacked in commercial acumen it made up for in determination to make an honest crust – tasty and wholesome bread without additives, produced in a way that respected the environment as much as the health of all the people involved, from farmers to eaters. Like a good loaf, the bakery ‘proved’ slowly. The wood-fired oven (an innovative response to the inadequate local electricity supply and the high price of oil) had limited capacity and there was neither room nor desire for fancy machinery to displace the harmonious work of hand and eye whose value we had begun to rediscover. Then came sourdough. In 1990 Andrew had the chance to re-visit Russia just as the Soviet Union was collapsing and the old flame of affection for sourdough rye bread was rekindled. A kindly Russian baker had swapped a small lump of sourdough for some British recipes and before long the Village Bakery became the unlikely supplier of the first authentic sourdough bread to a well-known UK supermarket. A new (French) wood-fired oven was built, capable of baking up to 500 loaves at a time. Not surprisingly, rapid growth brought its problems as the bakery responded to a seemingly insatiable demand for properly fermented bread. Andrew began to look into why so many people were buying his bread while complaining that the ordinary sliced stuff in the shops made them feel ‘bloated’ and worse. Eventually, in 2002, he left the Village Bakery to do a Masters in Food Policy at City University London and to write his first book Bread Matters, described by a reviewer as ‘a searing critique of commercial baking methods’. Published in 2006 (and then in paperback in 2009), it won the André Simon Prize and has stood the test of time, having been reprinted several times. 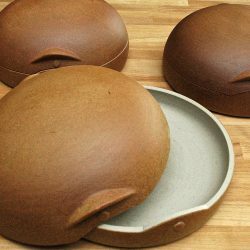 It combines reasons to avoid commercial additive-laden loaves with helpful instructions for making bread at home; many readers report that, since first reading it, they haven’t bought another loaf. Publication of Bread Matters revealed two things. People wanted to to get hands-on experience making bread at Andrew’s courses. And there was a real desire to do something about the state of modern bread. With the help of Sustain, Andrew came up with a plan for a Real Bread Campaign. Since 2008, the Campaign has been vigorously holding industrial loaf-lords, advertisers and policymakers to account and setting standards for bread that is ‘better for you, your community and the planet’. In late 2009, Andrew and his wife Veronica Burke moved to the Scottish Borders to work alongside a pioneering organic farm, shop and café, Whitmuir Farm, which had ambitions to create a living learning centre and to change Scottish food for good. Veronica came up with a stream of good ideas and raised the majority of the funds needed to start a community-supported bakery (Breadshare) and then Scotland The Bread which brings together research into more nutritious grains, production of flour and engagement with bakers – especially in communities with most to gain from a healthier and more equitable food system. On 5 acres of hilly land, Andrew & Veronica developed an organic agroforestry project, planting over 5,000 trees and forming sheltered alleys for a rotation of experimental cereal crops, vegetables and grass grazed by geese. The land fed both the bodies and the minds of those who visited. There is more about it here. 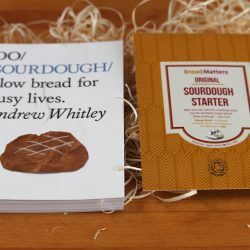 Bread Matters courses also revealed a demand for good quality equipment for the home baker, so the online shop gradually emerged, selling everything from Andrew’s books to proving baskets, tins and knives. The shop specialises in useful and long-lasting items made from organic or responsibly produced materials, such as the organic unbleached loomstate cotton for proving couches. Veronica was diagnosed with cancer in 2017 and died at the end of April 2018. Andrew’s words about her reveal the closeness of their partnership and her irreplaceability. It wasn’t possible to continue running courses after May 2017. The Scotland The Bread mill that had been established in the barn at Macbiehill Farmhouse, was installed at the Bowhouse in Fife in September 2018, where we are being supported generously and practically by the Balcaskie Estate, notably in the production of over 50 tonnes of diverse wheat and rye varieties in 2018. 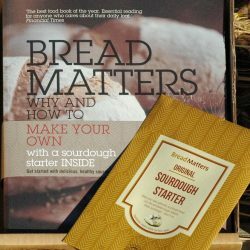 At some point in 2019, the Bread Matters online shop will be amalgamated with the Scotland The Bread equivalent to form a one-stop shop for heritage flour and the equipment and information needed to turn it into life-giving bread. The Bread Matters website will remain as a source of information and help with baking problems, and Andrew’s occasional writing (under the title of Cereal Offending) in which he will continue to challenge the status quo in the interests of health, fairness and a more agreeable world. Andrew plans eventually to move to Fife to lead the development of Scotland The Bread as it plays its part in turning Scotland into a Good Food Nation. And so as a ‘season’ draws to a close at Macbiehill, new growth is stirring North of the Forth. If you would like to keep in touch and you are not already on our mailing list, please sign up here. 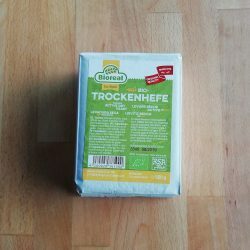 There is much work to be done!